Roßmann offers standard stamping parts for battery and rechargeable battery contacting. 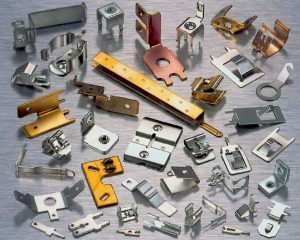 Our focus is on custom-made stamping parts. These fit exactly with the required application. The photo shows different stamping and bent parts. Almost every geometric shape can be realized. Standard parts from Keystone, MPD and Cambion are available from stock or with short delivery time. Different basic materials can be supplied with surface refinement. Coating with gold is possible, too.